Frankel saw a need and he aims to fill it with the Nucleus smart-home intercom. His tablet-like device does a lot more than simply enable two people to speak to each other from different rooms. It’s also designed to be an all-in-one, voice-activated control panel for the connected home. The Nucleus is outfitted with a mic and a webcam, and it connects to your Wi-Fi network. This enables it to stream audio and video between two units anywhere in the world. It’s voice activated, so if you’re in the kitchen putting the finishing touches on dinner, you can reach out to someone in the bedroom by saying “OK Nucelus, call bedroom” (you’ll of course need two Nucleus intercoms to do that). Alternatively, you can have the Nucleus communicate with an Android or iOS smartphone running the Nucleus app. 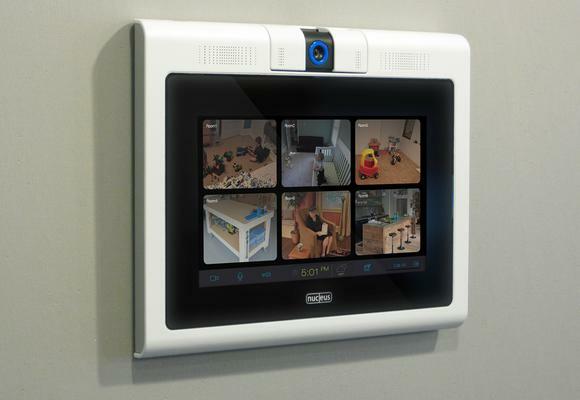 Audio/video streams between two or more Nucleus intercoms within a home remain on your home network; they don’t travel over the Internet. Streams between intercoms at different physical locations that must travel over the Internet are encrypted to ensure privacy. The Nucleus’ built-in camera can be covered with a shutter when it’s not in use. All Nucleus press photos show the panel conviently hanging on the wall, but its need for AC power could mean you might need have some electrical work done. Frankel says audio/video streaming is just scratching the surface of what his intercom can do. The Nucleus can also function as a smart-home hub (it can be integrated with Nest, OpenHome, and other platforms, according to Frankel) and it can stream music over your network (although that’s not particularly compelling). What is compelling is Frankel’s intention to sell the Nucleus for just $150. Not surprisingly, there are caveats: Some features (voice activation, video conferencing using the mobile app or over the Internet, motion detection, and the music player) require a premium service that costs $99 per year per household. That fee is waived (for life) if you preorder a Nucleus ahead of its anticipated ship date in the second quarter of 2015. The company says it won’t bill your credit card until shortly before your Nucleus ships. Frankel says he’s able to sell the Nucleus at such a low price because it’s based on off-the-shelf components running on Android. The only custom component is the plastic. The company intends to sell the hardware at cost and make its profit from the premium services. So the preorders that come with the service included are loss leaders intended to build an early customer base.